Social listening is a flexible and direct way to earn insight into understanding the mindset of your target audience. Audience research and conversation analysis allows you to identify a target population and analyze all (or a sample of) their conversations over a defined period of time. Campus Sonar recently worked with Spring Hill College (SHC) in Mobile, Alabama. Using conversation analysis, Campus Sonar helped SHC uncover their brand and define it so they could move forward, using the brand research to build their strategy. As the oldest Catholic college in the southeast and the third oldest Jesuit College in the United States, SHC is a highly residential college that focuses heavily on theology, psychology, philosophy, as well as traditional liberal arts majors. Ashley Rains, Assistant Director of Media Relations at SHC, knew that SHC was unique, but she wanted to better understand how others identified with the college’s brand. Just telling people “here’s our brand, identify with it” doesn't work. The marketing department wanted to know what people were saying about SHC on many different levels. Potential Students and Parents: Why did they choose SHC and what are they most excited about in their decision to attend SHC? Current Students and Parents: What do they think about their experience at SHC while they’re in school? Alumni: What are alumni saying and how can SHC create a partnership with them, increasing engagement and keeping them associated with the college? Community: What does the community know about SHC? Does the community understand the Jesuit mission of service and how the college gives back to the community? Ashley worked with Campus Sonar and analyst Emily to analyze SHC’s conversation. The analysis was surprising in a very, very positive way. Emily analyzed three years of online conversation and looked for emerging trends. She found that family emerged as a prevalent topic. Emily provided Ashley and SHC with a number of deliverables that helped them build their brand strategy. The three-year Social Listening Snapshot allowed Ashley and her team to look at the historical conversation surrounding SHC as a whole. It included volume, owned and earned conversations, and authors and influencers, and showed that “family” was a surprisingly common topic in the online conversation. In order to better understand the “family” part of the conversation, Emily and Campus Sonar dove deeper into the conversation and provided Ashley with a Conversation Analysis. Looking at the owned and earned content, Emily found that “family” organically surfaced in SHC’s content. It was well-received by prospective students, current students, former students, and their families; and many of the posts were often retweeted and shared by the SHC audience. A marine biologist alumna currently serving as the Foreign Affairs Specialist—Office of Law Enforcement for the National Oceanic & Atmospheric Administration in Washington, DC, has 1,538 followers on Twitter. She received her BS in Marine Biology from SHC in 2006. In 2015 she retweeted an article about SHC history, calling her time at SHC the “best years of her life” and saying she missed her SHC family. 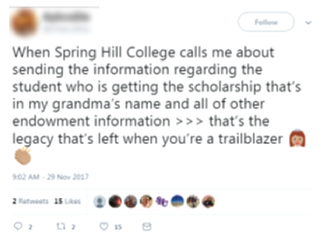 The granddaughter of a prominent alumna occasionally tweets about the legacy of her grandmother who was the first black graduate from an all-white university (SHC). Her tweet celebrating her grandmother is currently pinned to the top of her profile and has been retweeted over 2,500 times. 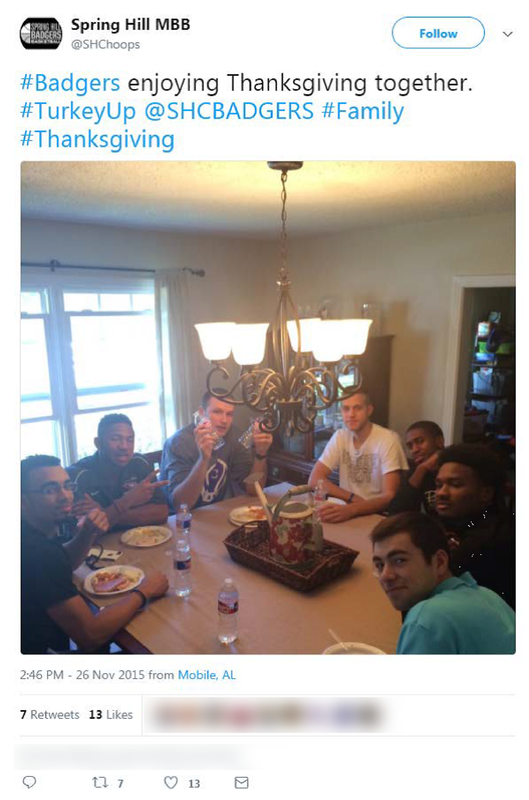 The SHC’s men’s basketball team tweeted a photo and tagged it with #Family when they gathered for Thanksgiving. The tweet resonated with the team and coaches/staff, as evidenced by the retweets and likes from this group. SHC knew that family was important, but they weren’t actively promoting it as their brand. Everyone knew that SHC was family oriented, coming to and leaving SHC makes you a part of a family forever, but they never knew how to articulate “family” to the students. To see that the message was out there organically was amazing—and something that SHC could begin to build a brand around. The data was research that supports strategic goals. To act upon Campus Sonar’s analysis, Ashley and her team put the report in front of SHC’s cabinet members to get their feedback. SHC doesn’t need to develop a whole new brand—family already matches their brand. It allows them to build on their current brand. SHC’s mission is “forming leaders engaged in learning faith, justice, and service for life.” “For life” is part of family. Strategically SHC is moving forward to develop a complete definition of family based on feedback across campus—allowing faculty, staff, and students to weigh in to establish a comprehensive vision. SHC wouldn’t have found the insights uncovered in the analysis without the help of a social listening conversation analysis. Being able to engage and further understand the public conversation about SHC has been vital to taking their branding to the next level. SHC continues to define and build their family brand using the strategy they develop from the Conversation Analysis and insights they gained from the three-year Social Listening Snapshot. You’ll find more about audience research and conversation analysis in our new go-to resource for everything related to social listening in higher education—The Higher Ed Social Listening Handbook. Learn how to build a social listening program at your institution and how social listening impacts campus strategy, using case studies from campuses like SHC and others, such as Beloit College, Loyola Marymount University, and Ohio State. You'll also find outlines for implementing data-driven strategies such as crisis management, engagement, brand management, and influencers. Read the full case study from Spring Hill College—Building the Family Brand at Spring Hill College. 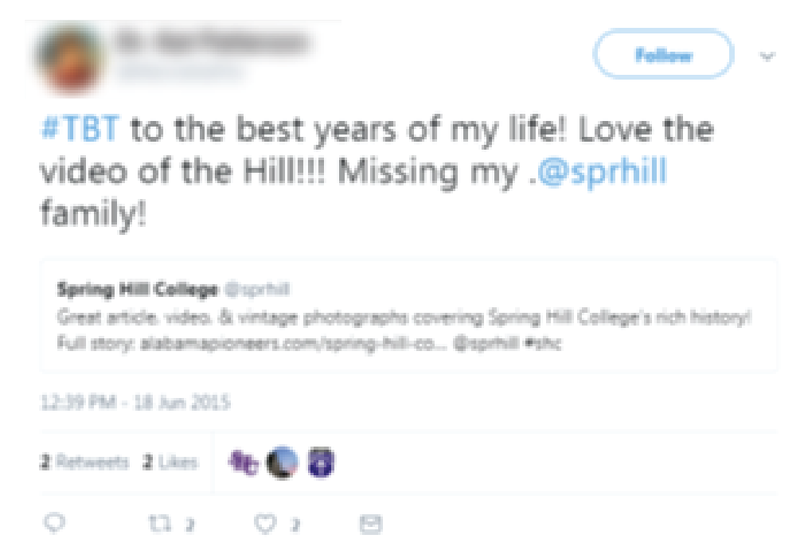 The post Spring Hill College Refreshes their Brand with Social Listening originally appeared on the Campus Sonar Brain Waves blog. Michelle Mulder is Campus Sonar's Content Strategist, building, managing, and creating content that aligns with the Campus Sonar brand. Michelle works with Bri to understand our audiences’ needs and provide them content to help them make an informed decision. With more than 10 years of higher education experience and 20 in educational publishing, Michelle enjoys the ongoing learning environment of Campus Sonar. In her “spare time” she gets a break from her three high schoolers by reading, going to barre class, and catching up on Netflix with her husband.